This is an article I did for a short-lived magazine called American Animal Trainer. It may have been short-lived because the owner/publisher wanted it to be filled with color photos on glossy paper. Or it may have been short-lived because they told me that they would pay for the Trans-Atlantic call for the interview. The call, which lasted perhaps an hour, cost $240. I guess I should have checked the rates before I made the call. I did a vastly better article for their magazine on Josip Marcan, a white Tiger breeder and trainer. I have yet to run down a copy of that article. 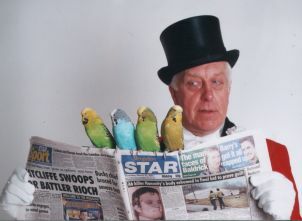 Anyway, the article on parrots, or “budgies”, or whatever, follows. Before Captain Cook went to Australia in 1770, only the aboriginal people knew about parakeets, a species of parrots known now to much of the world as budgerigars (BUJ-er-rih-gar). Budgerigar came from the aboriginal word “bedgerigah”, which essentially meant “good to eat.” At two ounces, budgies would be a labor-intensive and expensive foodstuff. Circus colleagues give the credit to Barrett, not the species. Barrett’s skills have their roots on the farm his father had in Canada. “My father trained all the animals on the farm to do tricks, and everyone thought he was wonderful. Yet when he trained animals for the circus, he became a cruel man in their eyes. He was the same George Barrett as ever. Key to the successful training Barrett’s “Amazing Learned Budgies” demonstrate is the care he provides his birds. With the Big Apple, a 40-foot Caravan was divided into two bedrooms, one for him and one as an aviary for the birds. He doesn’t use separate taming or training rooms. Barrett feeds the birds only seed, mixing with plain canary food. According to a professor at Liverpool University, vegetables are not needed if the right seed is used. He cuts down on the canary food in warmer weather, as it raises the birds’ body temperature. He provides them with grit all the time. Barrett checks claws and droppings every day and the rare sick bird is taken out of the aviary and housed separately. Norman’s working understanding with animals follows family tradition. George Barrett trained horses, dogs, and sheep to do circus tricks. When a visiting circus was impressed with the tricks, he sold the animals and joined the circus. Norman would be born into his father’s “Barrett’s Great Canadian Circus” after his family moved to England. Barrett’s son Guy became the third generation of entertainer. Guy does a magic and illusion act for which he designs all the illusions. Barrett has also trained chimps, pigeons, parrots, and cockatoos, along with his first love, horses. As a ringmaster, he has stepped in to work with horses and elephants and once saved a big cat trainer in Blackpool when the trainer had been attacked. He has worked with Katja Schumann since she was a child and cites her work with horses as influential on his training style. But budgies are his favorite. He considers them very intelligent, and is not surprised at the success Irene Pepperberg is having at MIT training parrots to use the Internet. Pepperberg’s work with her parrot Alex is described in “The Alex Studies” (Harvard University Press, 2000). Barrett uses males exclusively. While some trainers consider males more intelligent, he found the tendency of females to fight made them harder to train. Males do tend to “partner off”, so they are not without their own jealousies. The talking ability of budgies was discovered by accident in the 1930’s. Barrett doesn’t utilize this in the act, nor the ability off the budgies to mimic telephones dogs or doors. In the act, budgies jump continuously between perches 2 ½ feet apart. Birds go up a ladder and slide down a slide. They use a tiny seesaw, fire a toy cannon and raise a little Union Jack as they parade in a pinwheel. Birds run down a table, put their head in a harness, and pull a car. A trick he liked was having the birds fly around the arena loose, and then he would direct them to land on the table, like airplanes. However, lighting was difficult, and “someone in Germany tried to grab the birds.” He stopped doing that trick. The size of the birds isn’t a problem in appearances. He has played all types of venues. A promoter in Germany even wanted to book the act into a stadium, using video screens. While budgies in the wild may have an average lifespan of 2 or 3 years, domestic budgies can live past age ten. The current troop ranges in age from 1 ½ to 8. Barrett once had a bird that performed until age 12, then at age insisted on performing the entire act one last time the night before it died at age 13. The disciplined spirit of vaudeville permeates the birds. When Norman gets a new bird, its parents have raised it. He will quarantine the bird for two weeks, then begin training when the bird is 6 months old. He practices in the morning, although he doesn’t think time of day would matter. While Barrett uses English, French, German or Spanish as the circus plays through Europe, the birds work to body language. “It all depends on where I stand, where I move, what sign I make with my arms.” With so many birds, they don’t respond to individual names. Barrett learned patience from his father. “Take your time. The worst thing is a burst of temper.” Because his birds can eat all day, they don’t respond to food as reinforcement as parrots do. Instead, he strokes and fondles them. As an experiment, he kept a trained bird out of training for 13 months. It retained all of the tricks it had been taught. Barrett’s philosophy of respect would make him an ideal candidate to teach courses in management. “Factory managers around the world, in every country, don’t know enough about the work force on the floor. If they got to know a little bit about each person, personal contact, it would mean a heck of a lot to the person. I’m very interested in how people are. It’s not an act. I love people. All the workpeople on this circus and the Big Apple Circus come up in the morning and shake hands. You don’t have to love each other; you don’t have to be in each other’s pocket, but start the day correctly. For a man whose ethics are such an integral part of everyday life, the effect of animal rights activists on his beloved world is disturbing. “There are bad apples in every batch. There are bad farmers, bad riding schools…. but the vast majority of people in circuses don’t like to see animals treated badly. Norman Barrett’s skills as a trainer and entertainer come from the caring he shows for his job, his colleagues, and from his desire to fill every day to the fullest. His lessons for his own species may tower over those for his tiny friends. Dana Dunnan is a visiting scholar at MIT. He and his wife Judy live in Walden, Vermont and Greenland, New Hampshire. You can reach him at djdunnan@mediaone.net. They are currently training two boxers who came to them after being abused. Norman Barrett can be reached through Zippo’s Circus, at zipposcircus@yahoo.com.